I like to re-grip my clubs at least once a year. Grips wear down naturally from many different factors like ozone, heat and cold, and oils from your hands. It's extremely important to keep your grips in good shape, because a good grip will allow you to hold the club with correct grip pressure that allows your wrist to unhinge properly. 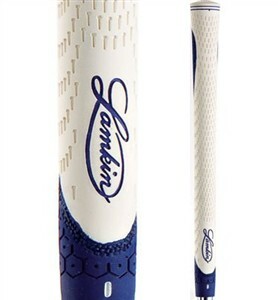 The Lamkin N-DUR is a multicolored synthetic rubber grip. It has a cool hexagonal design pattern on the underside. This part of the grip reminds me of the tail pad on my surfboard. Obviously, it is extremely tacky and adds more gripping support for your fingers. On the top, the material is softer and designed to be more comfortable and help lessen the fatigue in your hands. I like this grip. It is very modern-looking. White seems to be the new trend in grip colors with multicolor designs dominating the newer grips. I've even seen many tour pros sporting the flashy, multicolored design. For you purists, go ahead and check out these Golf Pride Men's Tour Wrap grips, and then check back with me in a year.